Everyone has fears they have to conquer. When we moved to Africa, over 25 years ago, there was a lot we could have been afraid of. We had a house in the middle of the bush. It was a rental and part of a cattle farm at the back of the property. During our 2 years there, we encountered a number of things that would send chills up your spine. We had a black Mamba slither across the floor next to our toddler, the sound of scorpions in the ceiling, baboons helping themselves to my vegetable garden. Jerry became a craftsman at killing aggressive snakes when they came around. One pound on the head and they die pretty fast. But there was one thing that Jerry, my brave husband, WAS afraid of and that was the gecko, the cute little lizard that helped out the mosquitos in the house. One day, he made up his mind he was going to overcome that fear. So, he saw the little guy on the wall and mustered up enough courage to go and take it with his own bare hands and squeeze it till it was dead. If you are a conservationist, forgive us, but this was a big deal to him at the time. Heck, he may freak out when he sees this story! From then on, the little creatures were free to live amongst us and do their job in our home. Even now, when I jump after seeing an even heartier version where we live he won’t let me send Cleo, our Jack Russell after it. A few years later, when the first two of our boys were still young, around 10 and 12, we were in Vic Falls, Zimbabwe with a team of over a hundred 100 from Global Adventures. We hosted their groups every summer for fifteen years. It was great seeing the young people have an awesome adventure trip, following 3 weeks of hard work in the villages, serving in various ways and learning about the rich culture of Botswana. They did everything from Bungee jumping off the Vic Falls Bridge, microlighting over the falls, white water rafting and gorge swinging. 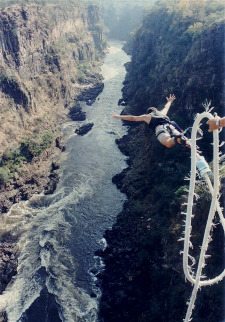 The gorge swing is a combo of a bungee jump and free falling with a 3 point harness for about 100 meters then swings across the huge gorge of the falls then up and down again till you land next to the Zambezi River. Do you have a fear today, something that paralyzes you? I challenge you to face that thing, and give it a good kick! You plus God equals conqueror!